Well, after a five-hit night in San Francisco, he should be. 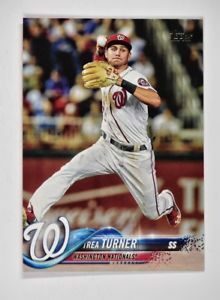 I have his 2018 Topps card, courtesy of my family. Yes, two packages of cards — also including Yankees’ Aaron Judge and Pirates’ Andrew McCutchen were in the packs that came as Easter presents. Of course, I collected Topps and Bowman cards as a kid; And no, my mother isn’t to blame for my inability to find them now. Somewhere between Fairfax and Newport News, two large aluminum tins disappeared. Alas, health, courtesy of mothers, dentists and probably doctors, strikes in 2018 in the Topps’ packages — no big slabs of gum. When I played right field, even in high school, I crammed two of them into mouth and blew bubbles — especially with slow-working pitchers. If I were pitching, only one and probably no bubble blowing. When playing second, one and bubble blowing. [Having been roll-blocked on a double-play and choking on the two slab-wad after hitting the ground, I cut back for safety’s sake]. What do right fielders do now when human rain delays are batting and pitchers believe if I don’t throw the ball, nothing bad can happen?